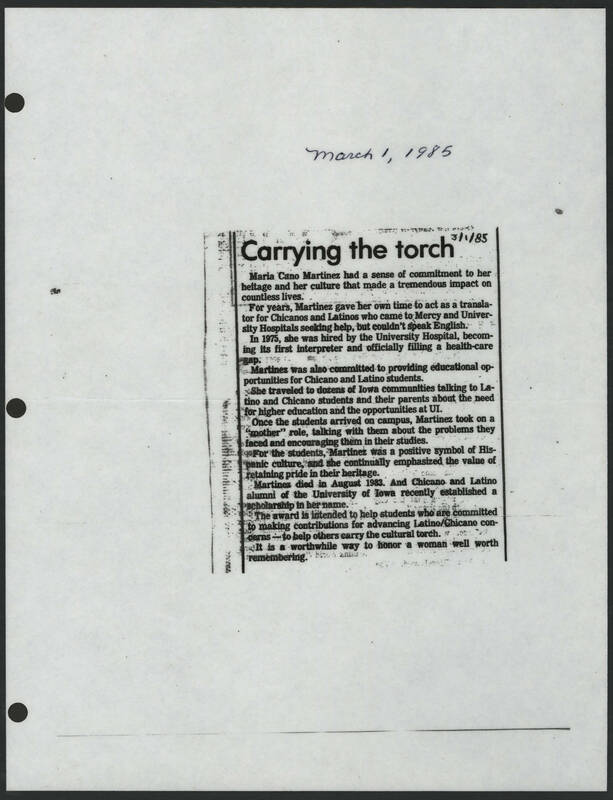 DIY History | Transcribe | Social Justice | Maria Cano Martinez memorial scrapbook, 1976-2005 | 1985-03-01 ""Carrying the torch""
March 1, 1985 Carrying the torch 3/1/85 Maria Cano Martinez had a sense of commitment to her heritage and her culture that made a tremendous impact on countless lives. For years, Martinez gave her own time to act as a translator for Chicanos and Latinos who came to Mercy and University Hospitals seeking help but couldn't speak English. In 1975, she was hired by the University Hospital, becoming its first interpreter and officially filling a health-care gap. Martinez was also committed to providing educational opportunities for Chicano and Latino students. She traveled to dozens of Iowa communities talking to Latino and Chicano students and their parents about the need for higher education and the opportunities at UI. Once the students arrived on camps. Martinez took on a "mother" role, talking with them about the problems they faced and encouraging them in their studies. For the students, Martinez was a positive symbol of Hispanic culture, and she continually emphasized the value of retaining pride in their heritage. Martinez died in August 1983. And Chicano and Latino alumni of the University of Iowa recently established a scholarship in her name. The award is intended to help students who are committed to making contributions for advancing Latino/Chicano concerns - to help others carry the cultural torch. It is a worthwhile way to honor a women well worth remembering.